SpaceX's first Falcon 1 rocket sits on its launch pad at Omelek Island on the Kwajalein Atoll, home of the Reagan Test Site, where it will launch its first payload FalconSat 2 for DARPA and the U.S. Air Force. The privatelaunch firm SpaceX will loft its Falcon 1 rocket on Nov. 25, marking thebooster's maiden flight and hopefully the first of many space shots to come,the company's chief said Friday. ElonMusk, founder and CEO of the El Segundo, California-based SpaceX, said hisfirm's first Falcon 1 rocket will liftoff from its equatorial launch site at 4:00p.m. EST (2100 GMT) on a mission to orbit a small U.S. Air Force Academysatellite. "I actuallydon't feel nervous, I feel relief," Musk told reporters during a pressconference. "No matter what happens next week, this is something that is thefirst stepping stone in reducing the cost of access to space." SpaceX'sFalcon 1 rocket carries a reusable first stage, the firm's homegrown Merlinengine and a price tag of about $6.7 million, SpaceX officials said. The rocket'sfirst flight will launch from the U.S. military's Ronald Reagan BallisticMissile Test Site on Omelek Island near Kwajalein Atoll in the Pacific Ocean'sMarshall Islands - where it will be 9:00 a.m. local time when the countdownreaches zero - though future spaceflights will also be staged from California'sVandenberg Air Force Base in California, they added. "We feel atpeace with ourselves in this launch because we've really done all we can," Musksaid. "I think that I can say with confidence that we've left no stoneunturned." SpaceX isusing its debut of the Falcon 1 rocket to launch FalconSat-2, a student-builtsatellite to measure space plasma's effect on global positioning system (GPS)satellites and other space-based communications systems, according to the U.S.Air Force Academy. The satellite is part of a program run by the U.S. Air Forceand the Defense Advanced Research Agency (DARPA). Musk, whoalso co-founded the electronic payment service PayPal, founded SpaceX - short forSpace Exploration Technologies - in 2002 to offer low-cost commercial spacelaunches. But the path to the launch pad has not always been smooth. The needfor additional checks of the Falcon 1's Merlin engine prompted a delay from anOct. 31 target earlier this year. The October launch target itself was afallback date for a planned Sept. 30 space shot, which was rescheduled after a problemcropped up during a Merlin engine test at SpaceX's test facility in centralTexas. "Weactually delayed the launch a few times to really put extra care into theengines," Musk said. SpaceX hadalso hoped to make its first Falcon 1 launch from its Vandenberg launch site,but encountered delayswhile waiting for a Titan 4 rocket to deliver a classified NationalReconnaissance Office payload into orbit. The firm also filed a lawsuitagainst Boeing and Lockheed Martin accusing the aerospace companies of violatingantitrust laws for U.S. government launch services. "Really,all we're asking for in that lawsuit is the ability to compete ona level playing field," Musk said. SpaceX'sFalcon 1 rocket has a four-hour window to launch FalconSat-2 into an orbit thatis expected to reach an altitude of about 310 miles (500 kilometers) at itshighest point. A staff ofabout 25 flight controllers and engineers will watch the space shot from acontrol center on Kwajalein Atoll, though the rocket's launch pad sits onOmelek Island, Musk said. Ifsuccessful, the space shot will be followed in March 2006 with the secondFalcon 1 launch carrying the TacSat-1 satellite built by the U.S. NavalResearch Laboratory for the Pentagon's Office of Force Transformation. SpaceX hassold a total of six Falcon 1 launches to date and plans to include a previously-flownfirst stage on firm's fourth space shot, Musk said. The second Falcon 1 rocketshould be completed within one month's time, with a third to follow in 2006, headded. Whileorbiting small payloads appears profitable - the U.S. Air Force awarded SpaceXan up-to-$100 million contract to launch satellites under its DARPA/FALCONprogram - Musk and his firm have larger goals in mind. Designs fora fully reusableFalcon 9 rocket are currently underway to launch payloads of 21,000 pounds (9,500 kilograms) intoLow Earth Orbit (LEO) in a medium configuration, and up to 55,000 pounds(25,000 kilograms) to LEO in its heavy configuration, SpaceX officials havesaid. 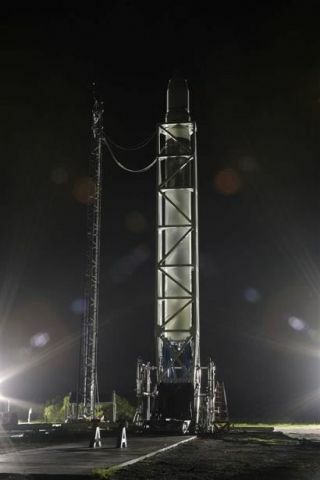 An intermediate rocket - the Falcon 5 - is slated to make its firstflight by 2007, they added. Musk saidSpaceX also expects to unveil plans for a rocket engine he dubbed "the largestone in the world" to in February 2006, as well as compete for NASA's commercial cargo contracts- and potentially crew flights as well - to resupply the International SpaceStation (ISS). "Ourfunding needed to complete the man-rated Falcon 9 is about $100 million," Musksaid, adding that he has financed about 98 percent of SpaceX's costs to datewith $100 million of his money. "My interest is in helping others get intospace and helping us become a space faring civilization." Musk saidhe intends to begin searching for investors to join SpaceX early next year, butis fully prepared to cover the Falcon 9 costs himself, if needed. The U.S.government has nabbed launch services aboard the first Falcon 9 flight set for2007. A second Falcon 9 flight is slated for 2008 for Las Vegas, Nevada'sBigelow Aerospace, which is developing inflatableorbital modules to support a private space station, SpaceX officials said. Musk saidhe also hopes to launch Falcon family rockets from Cape Canaveral, Florida inthe future, and believes that it is essential to push humans further intospace. "Becoming aspace faring civilization or a multi-planet species...it may well be the hardestthing that humanity ever does," Musk said. "Life has a duty to extend itselfand we, as life's representatives, should do so."